Hello! There is a new version of the game. One can build the game with french or german interface. See BUILD.CMD in the main directory. German version needs to be checked and completed (contribution welcome). Last edited by Roland Chastain on May 06, 2018 11:25, edited 1 time in total. Roland Chastain wrote: German version needs to be checked and completed (contribution welcome). Looks and plays very nice. Good work! paul doe wrote: Looks and plays very nice. Good work! You could always let the user choose the colors? Maybe provide a set of choices. You can find out how to select compatible combinations from different internet sites. Also I notice you refer to the pieces as black or white winning not the actual colors being used. I would have taken the blue as being the black. The game plays well. All I would add is a reset button and maybe a score for multiple games. Thank you for your observations and suggestions. I have started to study development of Android applications with Corona SDK. 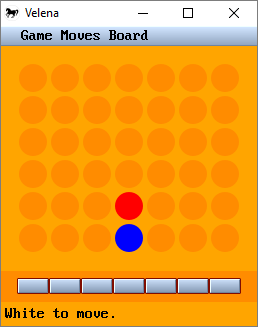 Maybe I will try to make a "connect four". But I am just beginning to learn.